Ground beef burger with cumin, corriander, sage, soy sauce and tobasco mixed in. Refried black beans between the bottom toasted wheat bun and the burger topped with aged cheddar, mashed avocado and chopped serrano pepper mixed together, garlic aioli, then a tomato slice followed by the top bun. Side of waldorf salad (lettuce, grapes, walnuts, celery, yogurt and lemon juice dressing). This was a fantastic burger! Perfect at the end of the summer in the heat and perfect after a good bike ride (I crave burgers after the end of a nice ride for some reason…everytime). I was a little hesitant that the alcohol was going to intensify the spice a bit too much, but fortunately the wine turned out to be more balanced than I thought and I only noticed it a little in fleeting moments. Those fleeting moments were certainly inconsequential as it took awhile to finish the 1/2lb of beef on this burger. Other than that, you can’t go wrong pairing something with southwestern stylings to tempranillo. As a somewhat embarrassing aside, I typically envision riding a horse through the coastal plains of Spain as I sip on this gem from España. If I could personify one wine, it would be tempranillo and tempranillo would be a cowboy or a caballero. Sure, go on and giggle now, but you’ll be cursing me the next time you take a sip from Rioja in particular and all you can think about is being a cowboy (or cowgirl). Additionally, this bottle from LAN was sporting a spiffy rear label. 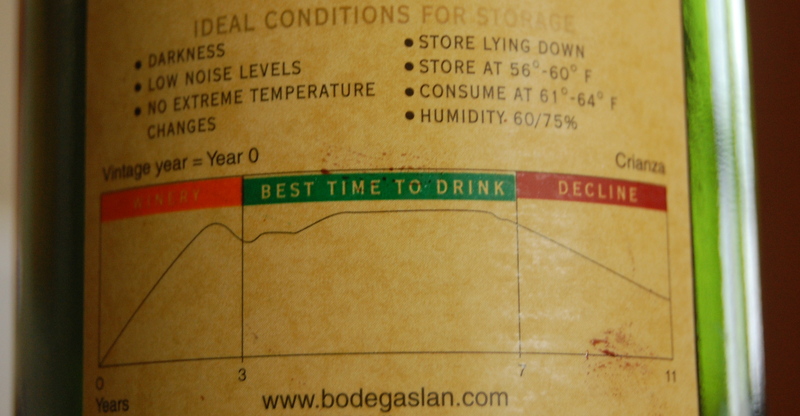 Not only do they give some good cellaring tips (as if you weren’t going to drink this right away), but they also give a cool chart to show you when the “Best Time To Drink” this wine is and I’m a sucker for a good chart. The Spanish, especially those in Rioja are typically very good at only releasing wines when they are ready to drink so their wines usually don’t need to be cellared for extended periods of time after you purchase it unlike the Bordeaux and Burgundies of years past. 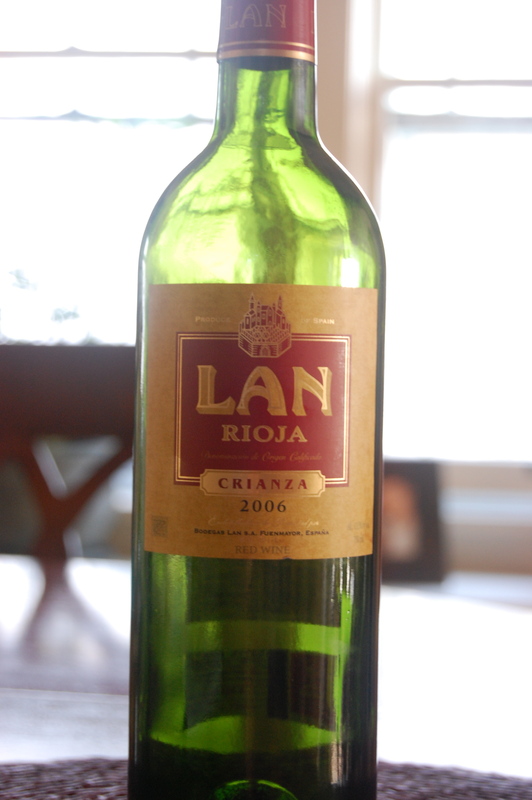 For the LAN Crianza, they had a suggested drinking time from 2009 to 2013 (3 to 7 years from the vintage date) which seemed like an adequate assessment. How they came up with the exact shape of the graph is beyond me, but I suspect their graphic designer had to get a bit creative.